I had been the pet parent of several sealpoint Siamese cats, but I’d always wanted a bluepoint female and I wanted to name her Luna. When the local SPCA’s Cat of the Week featured just such an enchanted creature in the newspaper, we jumped in the car and sped to claim her. 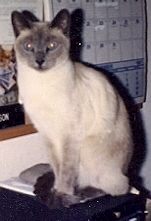 With her round, bright blue eyes (contrasted to the Siamese’s almond-shaped, slanted eyes), melodic voice (Siamese tend to be raucous), and sweet disposition, she wasn’t a bluepoint at all. 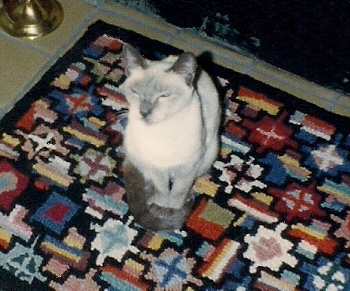 There she was, on the very cover of my Eyewitness Handbook of Cats: a blue mink Tonkinese. The breed originated in the 1930s in Burma (Myanmar) and is a mix of Burmese and Siamese. Whoever placed her in the pound had named her Misty, which suited her well, but I wanted a blue girl named Luna. She quickly learned her new name. 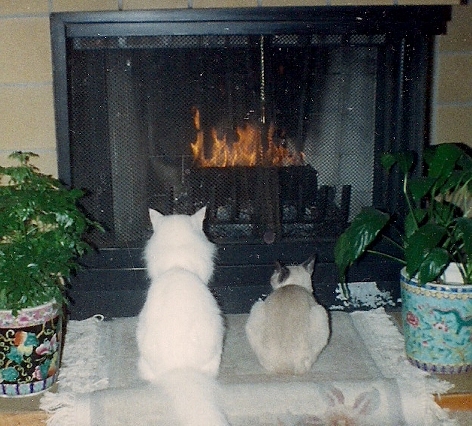 We’d adopted Alana, a purebred Turkish Angora, the previous month (also from the SPCA), and “the girls” instantly became the best of friends. Alana and Luna. They were like day and night, appearance-wise, but perfectly matched to the ounce. They often played (or fought), but never hurt each other. 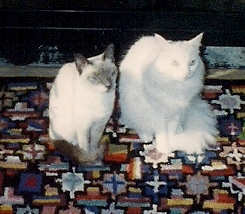 I remember watching them roll, cat over cat, down a very long hall. Their different styles of sparring could have been an inspiration to martial artists. Whoever placed Misty in the pound claimed on the adoption card she was two years old. But we noticed from the start that one of her little front zipper teeth was missing. In my experience, cats lose one or two of those teeth at age eleven or twelve, even with the best dental care. I was probably in denial that she was an old cat. Or I just didn’t care. When Luna died five years later, she was probably sixteen or seventeen. I immortalized Luna as one of Ruby A. Maverick’s cats in Summer of Love. She will live forever in my heart and my books, my sweet Misty Luna.